Take your day-to-day commute to the next level and enjoy unrivaled luxury when you choose an Audi luxury crossover. When it comes to compact luxury crossovers, few models can compete with the fan favorite Audi Q5. A perfect combination of style, performance, utility, luxury and affordability, the Audi Q5 will check all the boxes. 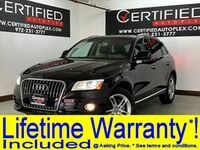 Drivers in the Dallas-Fort Worth area who are looking for a world-class luxury crossover at a great price can get behind the wheel of a used Audi Q5 in Carrollton, TX at Certified Autoplex today. Armed with an extensive inventory of luxury cars and crossovers that include countless years, makes, models and trim levels, Certified Autoplex is a one-stop shop for luxury automotive enthusiasts in and around Carrollton. A capable and luxurious, performance-tuned crossover, the Audi Q5 delivers an impressive level of space with room for five passengers in total comfort and 26.8 cubic feet of cargo space for current models. 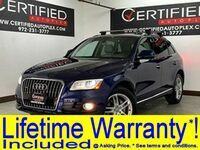 When you add affordable prices, low mileage and lifetime warranties, used Audi Q5 models at Certified Autoplex deliver on all counts. The Audi brand is an icon in the luxury automotive segment and the Audi Q5 is a standout in the brand's lineup. With all of the performance and luxury DNA that highlight Audi vehicles to go with a versatile, utilitarian crossover design, the Audi Q5 fits the bill for countless drivers. When you choose a used Audi Q5 in Carrollton, TX at Certified Autoplex, you will enjoy premium quality and affordable prices. Performance is a key attribute of the Audi Q5 that is apparent for all models. A turbocharged 2.0-liter four-cylinder serves as the gold standard for Audi Q5 editions and is teamed with Audi Quattro™ all-wheel drive to deliver unrivaled performance, acceleration and handling when faced with inclement weather or rough terrain. Pre-owned Audi Q5 models are available with practical diesel engines or fuel-efficient hybrid powertrains as well. Technology is another important asset for drivers who choose the Audi Q5 at Certified Autoplex. Highlight features of the Audi Q5 include the Audi MMI® infotainment system with an integrated touchscreen that provides access to Apple CarPlay and Android Auto. A rearview camera, panoramic moonroof, advanced safety technology, a power liftgate and Bluetooth connectivity are all standard elements for Audi Q5 models. 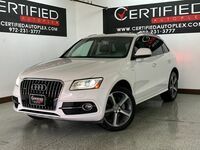 Visit Certified Autoplex today and get behind the wheel of a pre-owned Audi Q5 at an affordable price! Interested in a Audi Q5?